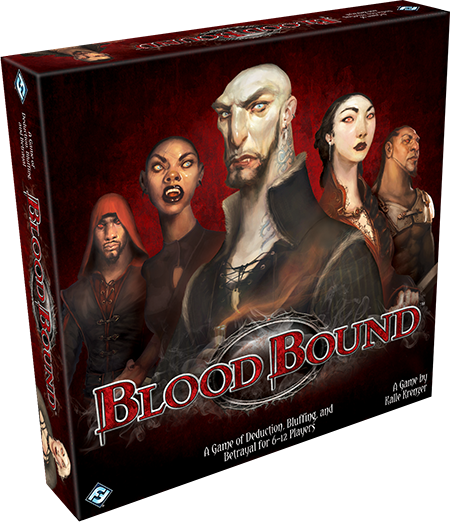 Fantasy Flight Games is proud to announce Blood Bound, a social game of deduction, bluffing, and vampire clans for six to twelve players! For centuries, you and your kind have ruled the darkness, feeding wherever you chose and turning more and more humans to join your clans. But conflict became inevitable as the clans grew in number and broadened their territories, creating an atmosphere of festering mistrust and betrayal. The ensuing war destroyed countless immortals, and the clan leaders were forced into hiding. There are only remnants left, but the war is not over. You will not rest until you’ve destroyed your enemies forever. In every game of Blood Bound, you and a few of your fellow players become a clan of vampires, working together to deduce the identity of your rival clan leader and capture him. Your adversaries—the other players—won’t be idle, however. They’re simultaneously working to identify and eliminate your clan’s leader. You must make your attacks carefully, but hunting in the dark is never as easy as it appears. In fact, you may not know your friends from your foes until it’s far too late. Important note: This edition of Blood Bound features the same gameplay and mechanics as earlier versions of the game, but with completely new artwork and graphic design. During a game of Blood Bound, your goal is simple—find and capture the leader of the enemy clan before your own clan leader is found and dragged out into the merciless light of the sun. Still, you can’t move too quickly. As an immortal being, you have the patience to play the long game—because if you move too quickly and capture anyone other than the clan leader, you’ve exposed your plans and your team immediately loses! The beginning of every game sets the stage for the paranoia and intrigue to begin by simply shuffling an equal number of character cards from each clan and dealing one to each player. For example, in a six-player game, there will be three Gargoyle clan members and three Phoenix clan members, but no one will know the affiliation of the other players! If you have an odd number of players in your group, there’s another layer of deception to navigate as the nefarious Inquisitor enters the game. The Inquisitor plays by his own rules, but if he’s able to win, both clans will lose as the vampires are eradicated by the zeal of the Inquisition. Once you’ve been dealt your character card, you may secretly look at it. Every character card shows your clan, your rank within that clan, and two affiliation icons. You’ll also notice a clue icon in the lower right-hand corner of the card. In most cases—but not always—this clue icon is the same as your clan. 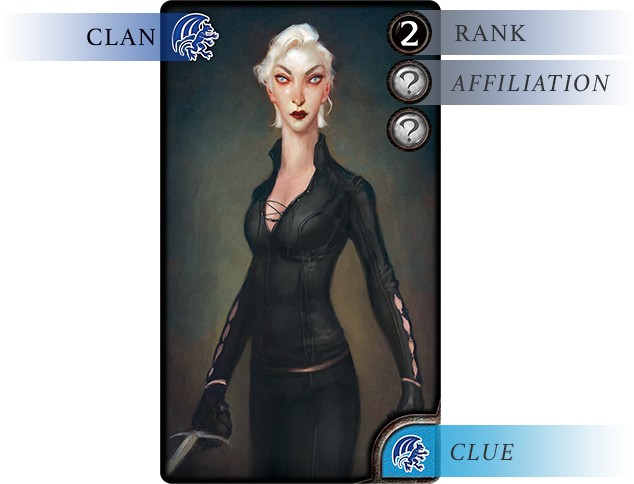 After receiving your character card, you must secretly show your clue icon to the player on your left. This gives you a little information to start the game—just enough to guess whether one of your neighbors is probably a friend or a foe. It’s not much to go on, but it’s more than enough to start fostering fear and uncertainty! During the game, the player who holds the dagger is the active player, and when it’s your turn, you must choose to either attack or pass the dagger to any other player. Obviously, if you choose to pass the dagger, you’ll need to consider the recipient carefully—if you give the dagger to a hidden enemy, you could find an attack coming right back at you! If you’re eager for more information, however, you can choose to attack. 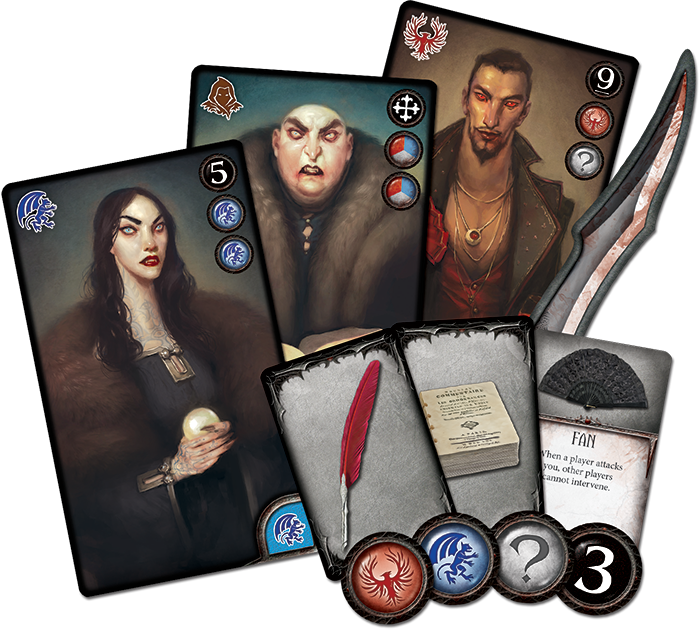 Every attack forces your target to suffer a wound, and each wound forces a player to reveal information by claiming a token corresponding to one of the icons in the upper-right corner of your card. Of course, the more information you reveal, the more vulnerable you become. Revealing your affiliation icons could give away which team you belong to, but disclosing your rank could cause other players to realize that you could be the leader of your clan! There’s a benefit to suffering a wound, however. If you’re the target of an attack, you receive the dagger next, giving you the chance to enact terrible vengeance. By attacking and inflicting wounds on the other players, you’ll start to get a sense of your teammates and your rivals. Meanwhile, you want to avoid being attacked yourself. Suffering wounds forces you to disclose information, and revealing any information about yourself is dangerous. It can make you a target for your rivals, or even a member of your own clan who believes you’re lying. You may be able to curry good favor by passing the dagger, or you may try to convince other players to attack your rivals for you. Anything works, so long as it deflects attention from you! There are other benefits to revealing your rank as well. Every rank has a different ability, and when you reveal your rank token, you may trigger your character’s special ability. Some abilities, like the Mentalist, force another player to suffer a wound and reveal his rank. Others, like the Guardian, provide protection to another player. Because your ability may only be used once per game, your timing is essential. Wait too long, and you miss the best time to use your ability. Use your ability too early, and you must play the rest of the game with your rank revealed. Either way, you’ll need to be as cunning as possible if you’re going to uncover who is truly loyal to your clan. In Blood Bound, everyone has something to hide—and the honest faces are usually attached to liars. Gather your friends, and prepare for a game of secrecy, deduction, bluffing, and betrayal. Look for Blood Bound (HB11) at your local retailer in the third quarter of 2017!